Have you ever gone out and enjoyed a new 3D movie and wish you could take the experience home with you? Augmented reality makes that, well, a reality! Unlike virtual reality, where you can fly in the sky with birds, augmented reality lets you take a backseat and enjoy the birds zipping around you, rather than give you the feeling of flight. It's basically like a more interactive pop-up book that doesn't involve opening any books. 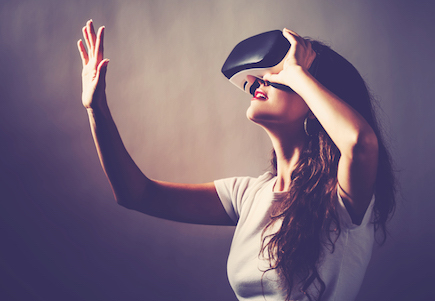 Tech companies have been playing with this form of technology for years, and now a major player in the tech game has their sights set on this type of entertainment. Apple has always been on the cutting edge of technology. If it's new, chances are they already have a prototype made before the information reaches the masses. But could an augmented reality product from Apple eventually become the death of the iPhone? According to expert Apple analyst, Gene Munster, it is part of the late Steve Jobs' plan of action. In a recent letter to clients, Munster has let it be known that an augmented reality device is next in line for Apple and that is may very well be the beginning of the end for the iPhone. "We believe that Jobs instilled the idea of innovation in Apple without the dogma of holding on to old markets that move away from you whether you like it or not", says Munster, "While Apple has yet to launch a product that cannibalizes the iPhone franchise, we believe that the company realizes that the smartphone as we know it won't last forever. To this end, we believe Apple continues to explore mixed reality and virtual reality, which in our opinion will be the future of computing." Looking back at the history of Apple's products, it's obvious to see that the company continues to outdo themselves and kill off weaker versions of products now available (some major examples being the death of the Macintosh PC and iPod). With augmented reality technology, it will start off being introduced on the very platform it will eventually cannibalize. Fear not though! iPhones will be around for some time to come, as Munster doesn't believe they will be "wiped out" for about another 20 or so years. That leaves plenty of time for lots of new upgrades and new products from Apple for everyone to enjoy, and not shock anyone as iPhones slowly start to change into something totally different and even more entertaining.